The Supreme Court will hear one appeal and hand down one judgment this week in what is the final week of the Easter term. 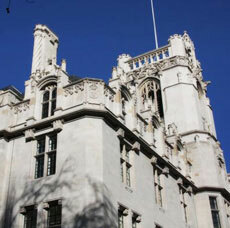 On Monday, Tuesday and Wednesday a seven strong bench consisting of Lords Hope, Rodger, Walker, Brown, Mance, Kerr and Sir John Dyson will first hear an application for permission to appeal in the case of Cadder v HM Advocate (Scotland) and will then hear the full appeal in that case immediately after, assuming that permission is granted. This is a criminal case raising a devolution issue following a hearing before the High Court of Justiciary in Scotland. The appellant is arguing that his Article 6 right to a fair trial was infringed by the use at trial of evidence obtained by police interview without legal representation. The Advocate General for Scotland and JUSTICE are intervening. The case details can be found on the Supreme Courts website here. The Supreme Court has announced it will hand down judgment in the case of OB (by his mother and litigation friend) (FC) v Aventis Pasteur SA on Wednesday. The judgment has been prepared fairly quickly as the hearing only took place last month. Aventis Pasteur SA had argued OB’s case against them for damages, following a defective vaccination, was time barred but it seems likely this judgment will be bad news for Aventis, following a preliminary ruling on the interpretation of the relevant provisions of the EC Directive on product liability by the ECJ in December 2009 (see here). Our case preview is here. We mentioned in earlier posts that Lady Hale has been travelling: to New Zealand and then to the International Conference of International Association of Women Judges, in Seoul, South Korea. The speeches which she delivered in New Zealand and South Korea are now available on the court’s website. We will consider them in more detail in later posts. The Court has announced that on 1 and 2 June 2010 its Law Library will be open to the public who will be able to see a number of works of art and what is described as an “eye catching wood and glass balustrade with quotations chosen by some of the Justices“. The collection is interesting and eclectic, from Plato to Megarry via Disraeli and Tolstoy – full details can be found here. The Court’s works of art are listed on the “Art at the Court” section of its website. The Judicial Committee of the Privy Council will also hear one appeal and hand down one judgment this week. Sitting for four days starting on Monday Lords Phillips, Saville, Collins, Clarke and Dame Mary Arden will hear the case of James Henry Ting & Ors v Cosimo Borrelli as Liquidator of AKAI Holdings Ltd & Ors (Bermuda) on appeal from the Bermudan Court of Appeal (see here). The case details are on the Privy Council’s website here. On Monday the Privy Council will hand down judgment in Larry Winslow Marshall v Deputy Governor of Bermuda another case on appeal from the Bermudan Court of Appeal (see here) which will determine the legality of enforced military service in Bermuda. The appellants made a number of arguments including that conscription violates their human rights and that the conscription of men only is unlawful discrimination. The case details can be found on the Privy Council’s website here. Leave a reply on "In the Supreme Court w/c 24 May 2010"